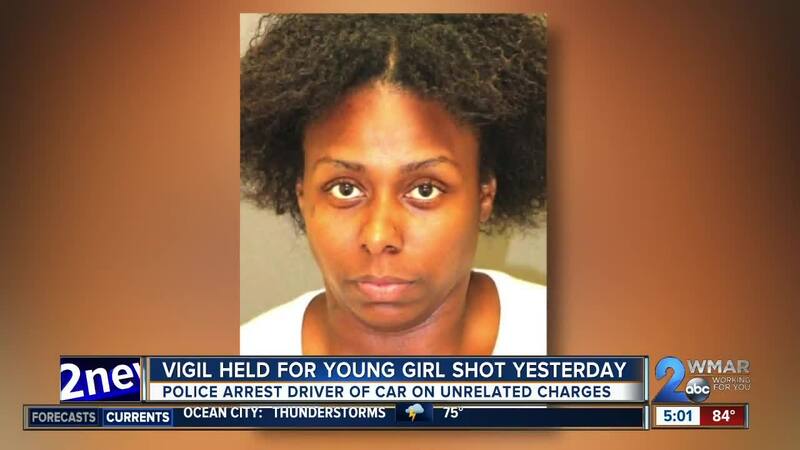 The driver of the car a 7-year-old girl was riding in when she was shot yesterday in Edmondson Village was arrested on gun and drug charges, though she is not charged in the shooting, Baltimore Police said in a press conference Friday. Police say 7-year-old Taylor Hayes is still in critical and unstable condition at Maryland Shock Trauma Unit following being shot while sitting in the backseat of a Honda in Southwest Baltimore. Darnell Holmes, 33, of the 1400 block of Pennsylvania Avenue, is charged with handgun and narcotics offenses after a search of that Honda revealed a 40 caliber gun, a high capacity magazine, and drugs that were "not marijuana," Baltimore Police spokesman T.J. Smith said. Police say she is not cooperating with them. Holmes is not related to Taylor, but she is related to another child who was also sitting in the backseat of the car next to Taylor, police said. That child is unharmed. Police are not sure where they were going or why Taylor was in the car, but they did say that the two children and Holmes had been to an amusement park "a day or two prior," Acting Baltimore Police Commissioner Gary Tuggle said. Police said the shooting occurred in the 500 block of Lyndhurst Street, where multiple shell casings were found, leading police to believe there were multiple shooters. "There was some encounter. Whether or not is was one car following another car or a car in that specific area that just started shooting at the car that Taylor was in, quite frankly we are not sure," Tuggle said. The gun found in the car with Holmes matched shell casings at the scene, though "she’s not charged with any crime related to harming anyone,” Smith said. Police are not sure if the shooter was driving or on foot. "We do not believe this was a random act of violence," Tuggle said. "We believe it was targeted." The car Taylor and Holmes were in had very dark tinted windows, and police are unsure if that played a part in the shooting. "So whether or not they were looking for somebody that they couldn’t see but thought they were in the car, we just don’t know," Tuggle said. After the shooting in the 500 block of Lyndhurst, the car came to rest at the intersection of Edmondson Avenue and North Loudoun Avenue, not far from where an officer was positioned. A witness flagged him down, and he rushed to the scene to render aid. "He sprinted to the vehicle on Edmondson Avenue and immediately began performing life saving efforts," Tuggle said. Read spotted a private ambulance at a residence in the neighborhood who then rushed Taylor to Maryland Shock Trauma. "It's by the grace of God one of the best trauma surgeons in the country, Dr. [Thomas] Scalia, happened to be in the trauma bay, with the trauma team, when Taylor arrived," Tuggle said. "At this point Taylor continues to fight for her life." Police continue to implore the public to come forward with any information possible about the crime or possible suspects, offering up to a $4,000 reward. Investigators are currently combing through city and private surveillance footage. They are looking for a white two- or four-door white car with black or dark paint transfer that might be connected to the shooting. "We don't have our shooter in custody right now," Tuggle said. Detectives canvassed the area of the shooting Friday afternoon, working to bring justice for a very strong 7-year-old and her family. "Prior to this happening, she was just a normal 7-year-old kid who likes to dance and loves music and now she’s fighting for her life. It’s truly a tragedy," Tuggle said. Taylor's family has started a gofundme to raise money for medical expenses.